Maggie Mae’s, established in 1978, is the epitome of all things Austin. With over 15,000 square feet of event space, 7 bars, 3 stages, multiple floors, a max capacity of 1,000 guests and a location that is steps from the convention center and numerous prominent downtown hotels… This is Austin’s most iconic and premier private event destination. Our open air courtyard welcomes guests to our venue. With ample seating, exposed brick walls and access to multiple bars, the courtyard is where all the action starts. Combined with the Courtyard Bar and the Legacy Lounge we can accommodate up to 300 downstairs. The Gibson room is the epicenter of cool. With one of a kind Gibson Guitars, tons of rock and roll anthology on the walls and floors, Hollywood Regency furniture, a stage fully set for eccentric musicians and a posh bar stocked full of local craft beer and spirits….it’s no wonder the Gibson Room is our most popular private event space. The Rooftop Deck is what Maggie Mae’s is all about. 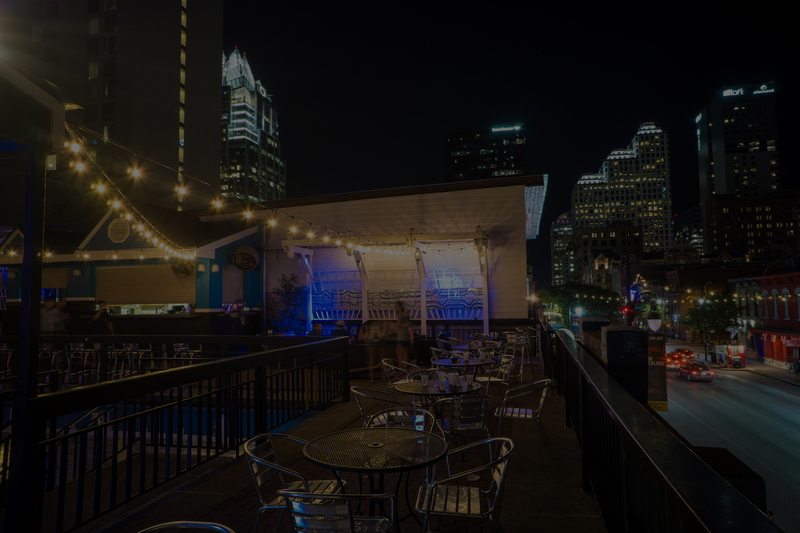 With views of the city skyline, a huge stage for memorable performances, multiple bars and space for 300 of your closest friends the Rooftop Deck is the hub of Maggie Mae’s and the largest space for groups to gather. It is also the first Deck on Sixth Street. Combined with the Gibson Lounge, our entire upstairs can accommodate up to 500 guests with 3 bars, 2 stages and a true Austin experience. Exposed brick, distressed wood, barn doors, multiple local crafts on tap, a quaint stage with musicians playing Austin’s best and a huge mural depicting the history of our great city, the Legacy Lounge is a great representation of all things Austin, Texas. With a capacity of 150 guests and with direct access to the Courtyard and Courtyard bar we can comfortably accommodate 300 of your closest friends. Come have a pint and appetizer. See you soon…. The walls in the LP Room tell you all you need to know. With one of a kind guitars, custom art, platinum records and tons of memorabilia, the LP Room is a wonderfully quaint room for up to 50 of your favorite friends. Combined with the Gibson Room (to which it’s connected) we can accommodate up to 200 guests. A true Austin original. Our Pub has just as much history as the wood bar top that has the etchings of the celebrities, bands and local legends that have frequented where Maggie Mae’s all started. The Pub serves multiple domestic and international pints along with signature locally crafted cocktails. With a capacity of 100, the Pub is a great place to mix and mingle. Maggie Mae’s is one of, if not THE, matriarch of the city. With over 40 years of memories and a location directly in the epicenter of 6 th St, Austin’s historic entertainment district, Maggie Mae’s is the authentic experience. Comprised of multiple buildings constructed in 1855, the architecture and character shines brighter than the lights on our 3 stages. 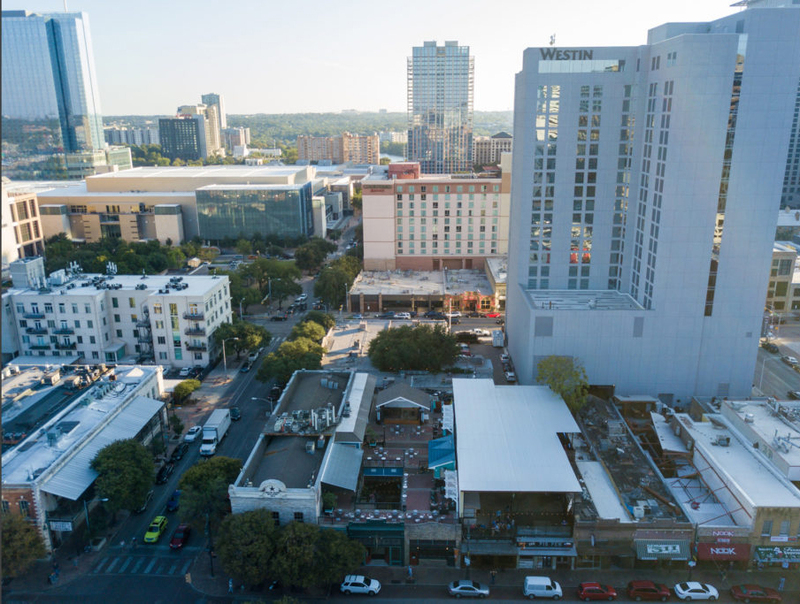 We are located just steps from the Austin Convention Center and blocks from every major downtown hotel. We have a maximum capacity of 1,000 Guests, multiple floors, 7 bars, 3 stages and a tenure that nobody else on 6 th St can come close to. Our venue specializes in memorable private events. Custom cocktails, local crafts, select wine and a culinary experience that can’t be matched. As the historic Austin slogan says…..”Come and take it”.